Three day weekends rock my socks. We spent the weekend up at my mom’s lake house and it was awesome…..mostly because my mom is amazing and took care of us all weekend and I finally got a little rest and relaxation in. Mental note: be just like my mom. And I rocked the “lake look” all weekend….aka had chubby feet and hands, didn’t wear makeup, and didn’t do my hair. So no cute pics of me. 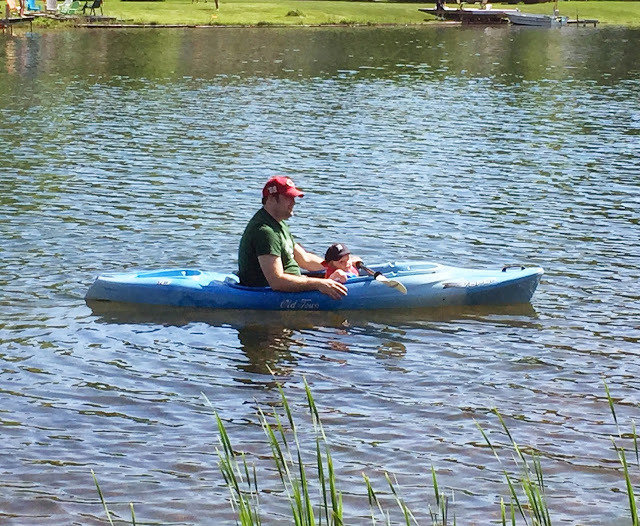 But I did manage to get a quick pic of my husband and Hudson on the kayak….Hudson lasted a whole 3 minutes before asking to get out. And then that’s all he talked about all weekend. Little stinker. He also scored big time in the toy car department when my mom and husband went garage saleing while Hudson and I napped. This boy has it made. As if he needed any more toys. I’ve mentioned before that my mom kept a bunch of my old toys…and I’m so glad she did. It makes my heart happy to see him loving the things I used to love. Can you spot the pound puppy and care bear? I also took advantage of some weekend online sales and ate my weight in homemade chocolate chip cookies. Such an amazing weekend! I hope you had a restful and enjoyable weekend! Lake like is amazing life, right? We always go to the lake in the summer and I love it so much. Less people go to the lake so I like it more than the beach :)! My mom kept a bunch of my toys for my kiddos too. Now that they're older, I've saved them for their kids!!! They sure don't make toys like they used to! 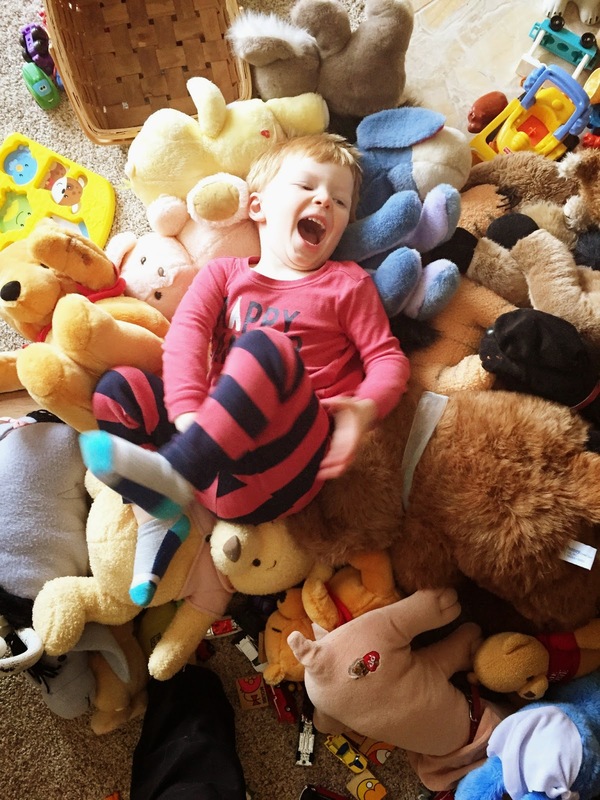 I cant love that picture of Hudson in the pile of stuffies more! Definition of "pure joy" right there. Is that Birthday Bear? Reed currently has my Birthday Bear at my mom's house along with two big pound Puppies and two little ones. I love seeing him with those! Lake life sounds perfect to me:) I know Hudson must have loved it! lake life sounds like it kinda rocks! kayaking, no makeup, and lots o toys! Being from Minnesota, Lake Life is my absolute favorite part of summer! It just doesn't get any better, does it? It was a nice weekend, I'm glad you had fun!